There are two more stanzas, but it is the first one I return to again and again. At first glance , the opening sounds like a shocking, angry thing to say. But as you read the poem you realise that it isn’t angry as much as sad: that the poet is saying that parents are neither malicious nor cruel but merely pass on to their children their own faults, fears, hopes and aspirations. And it is this theme that I often return to when talking to my friends and family with small children. In the film Inception, the entire plot revolves around planting an idea in somebody’s mind so that eventually they believe it to be their own idea. All very far-fetched and fictional – but if you think about it, this is what parents around the world do, day in and day out. If your mother told you from a young age that cats are dirty and steal your spirit when you sleep, you are unlikely to be a cat lover in adulthood. If your parents were deeply mistrustful and suspicious of strangers, it is likely that you will not be the most gregarious person in the room. And if your dad told you repeatedly how dangerous everything is, you are unlikely to be a life-long risk-taker. My father would no doubt be horrified to hear the when I opened my fridge last week to find something to make for Kavey’s spice challenge, the first thing that caught my eye was a bag of death-defying prawns! When my sister-from-another-mother Meeta and Saucy Spice Jamie came to visit in December, we arranged a blogger brunch at Village East (soon to be blogged!) where the lovely Kavey gave us each a packet of mystery spices which we were to use in a dish by mid-January. Out of a dozen or so packets of spice, there were only 2 that were the same… and of course, these were the ones Meeta and I picked: lemon pepper. Meeta chose to make macarons with hers (no surprises there! ), but I knew mine would end up somewhere savoury: a lemon pepper and prawn risotto. I have to say that the Danish Hedebogard lemon pepper is the best blend I have ever tasted and included not only enough other spices to make it intriguing but also dried lemon peel that tastes like lemon, not like chemicals. It lifted the prawn risotto into the realms of the stratospherically good and is definitely on my shopping list from now on. Thanks, Kavey – for the pepper and the fun challenge! If you are wondering where I got the pretty little bamboo scoop holding the lemon pepper, it was kindly sent to me by Restaurantware, who make an attractive range of bamboo disposable crockery for catering professionals. Heat a little olive oil in a pan. Season the prawns with seasoning of your choice (I used the lemon pepper) and heat through for a few minutes over low heat. Keep warm. Melt the butter together with the olive oil in a large, heavy-bottomed saucepan. Add the shallots and saute until translucent and soft but do not let them brown. Add the rice and cook for a minute or two, stirring constantly stir so that each grain is well-coated with oil/butter. Add the white wine and lemon juice and keep stirring until the liquid has been absorbed almost completely. Add the hot stock a ladleful at a time (probably about 150-200 ml per ladle). Keep stirring until each ladleful has been completely absorbed, but do not let the rice dry out and stick to the pot. Once each ladleful is absorbed, add the next until the stock has all been added. The rice should be soft but each grain should retain some bite in the centre, perfectly al dente. Before you add the last ladle of stock, stir in the prawns. When the rice is cooked to your liking, stir in the Parmiggiano and remaining butter in cubes. Check for seasoning and season with lemon pepper. Serve in wide, shallow bowls, garnished with grated Parmiggiano and fresh lemon wedges. I paired mine with a 2009 Auckland Bay Sauvignon Blanc and i have to say, it brought out the flavour of the prawns unlike any other wine I’ve ever had with seafood – highly recommended! Dont forget to check out the series of posts we are running on the Plate to Page workshop blog this week featuring a review of 2010 and plans for 2011 from our four workshop instructors Ilva, Jeanne, Meeta and Jamie. The May 2011 Plate to Page hands-on food writing and photography workshop is now sold out – but register now if you are interested in Plate to Page II in Italy in Autumn 2011. Delicious and creamy! 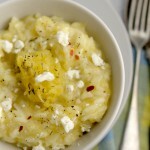 I love lemon flavour everywhere, especially in risotto, as it gives new life to everything! I should definitely try this kind of pepper! I couln’t agree more, the fears I have today are too many to mention! Thank God I have overcome my fear of making risotto. The prawn and lemon falvor combo is genius! You are so wise, my friend! I’d have to say that perhaps I am less of a risk taker in my “elder” years than I was in my twenties. My friends smile an all knowing smile and know that if money were endless this girl would be living a very different life. Last year I finally ate shrimp with the heads on and eyes peering at me so my culinary risks are improving. I do love lemon pepper as it makes a nice foile for my fish dishes. Great combo… but not so great as the prospect of you bungee jumping. That I really want to see! Isn’t that an apposite and yes, sad, verse from Larkin? It definitely has the ring of truth to it. As I’ve been getting older, I am deliberately trying to be more spontaneous and risk taking. happily the one thing that my parents weren’t afraid of is food, I grew up trying anything new that I could get my hands, loved my fish raw, my flesh rare and taste wide. It meant that as I grew older and travelled I was not worries bout diving into new cuisines and ingredients, and now have a love for Asian food (of all stripes) in particular. Lovely sounding recipe too – i bet that lemon pepper adds a wonderfully citrussy heat to a creamy risotto. Inspired use of the spice. It may reassure you to know that my Mother still tells me to ‘put a cardigan on if you’re cold’. It drives me completely mad as I’m a forty-somthing mother of 2 teens. Like Larkin’s poem there is a flip side to this – the desire to protect and love which can be stifling or wonderful depending on how you receive it. Having to break out of that mindset of not taking risks has the reward that it feels wonderful when you do! Lovely risotto by the way. Shared the Larkin poem with my 30-year old daughter, who – happily – smiled, laughed, and agreed. Saved the recipe to try a bit later. Oh my goodness. That looks so delicious I want to weep! I’m also a little scared of rollerskating, horseriding, skiing and even bicyles. Luckily I’ve never met your dad so yoghurt is still safe for me! Lovely recipe. Delicious looking Jeanne! I also love the container you have made it in. 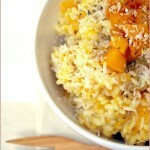 The lemon in this risotto must lighten it up. I love this recipe and the wonderful pictures! Your warm and delicious risotto would really calm me down now. I hear it 🙂 but now I wish I had my mom to tell me do what I would have never approved when she was here. I feel so sad. Prawn/shrimp is my favorite thing, and this sure is a thing I could have for my dinner right now. I’m going to thank you for this. Lemon pepper is a flavor combination I always forget about… and yet, it’s so perfectly executed here. Kudos. This looks like a wonderful way to enjoy that “forbidden” fruit. So true! Parents are well meaning, but in the end, I suppose, only human. And it’s a momentous day in each person’s life when they realise that there parents are just that – human. 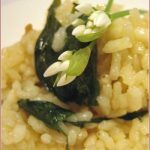 Great looking risotto – throw all caution to the wind! PS: Love that polkadot tablecloth! OH well, my parents had their faults too, but who does n’t; it is nice though when you have your own kids you try to avoid doing what your parents did to you. so in the grand scheme of things, it all works out! nice risotto, too. Oh, what a brilliant poem and a brilliant post! As both a daughter and a mother I understand completely! And I truly do think it works that way no matter how much adolescent boys fight back and try and do exactly the opposite of what their parents teach. And I am so like you, but to tell you the truth I think I am the only one of four kids who has always been afraid to jump without looking! And, like you, I am both a crustacean and a risotto freak and this lemon and prawn risotto is making me crazy because can’t eat a big bowl of it. This would seriously be on my “what’s your favorite food” list! Fabulous!!! I loved this challenge! Jeanne, since I read about this on Twitter I’ve been drooling! What a fab idea, and one I’ll be trying very soon!! What great unreserved writing, even better than the food.! With sharp pictures, as the perfect accompaniment.